Farah Khan has finally come out with her much awaited talk show, Tere Mere Beach Mein, which will feature her favorite celeb friends and will discuss a particular topic pertaining to the chosen guest and the audiences. For her opening show, Farah called on her childhood friend Salman Khan and his mother Salma Khan to discuss their relationship. 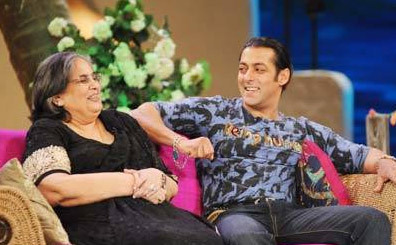 Maa Da Laadla Salman had no qualms in admitting that he is in fact, a mama's boy. The actor opened up on how he is looking for similar qualities that his mother has in his girl. He went on to admit that he felt that the attachment to his mother were because of the many hassling situations he had seen and thus needed the comfort of his mother. Salma Khan went on to talk about Salman's childhood as a young and naughty boy and additionally added that he was extremely sacrificing. There were moments of tears when Mrs. Khan remembered the time when she went to see Salman in jail. However, it was good ol' Sallu who lightened the moment and told his mom not to cry like "Rakhi Sawant." She also spoke about the hoard of fans that flock to the Khan residence over the weekend all hoping to get a glimpse of the superstar, which she refers to as"Salman Darshan." Some lighter moments included a segment where Salman had to choose from Reema Lagoo, Mallaika Sherawat, Kiran Bedi and Farah Khan as a substitute mom. He quickly and jokingly chose Sherawat and pleased the audiences. And to add more comedy to the already fun episode, a young seventeen-year-old fan came running dressed as a bride ready to marry Salman. The gracious actor presented her with his own watch from his charity "Being Human." With many more fun conversations, it was a fabulous start to the show which promises to be fun and yet informative courtesy of its unique style! We'll be back with more from Tere Mere Beach Mein next with when Priyanka Chopra and Virender Singh both grace the show.